How was your weekend?! Did you have a good Valentines Day celebration? I mentioned that we had friends (Claire and her husband) staying the night with us on Friday - it was as wonderful a time as I expected. A lot of our weekend fun revolved around food... let's just say that these pants were a little tighter than normal this morning :) Lots of steak, bacon, wine... basically the stuff dreams are made of. I know this is going to be so annoying to a lot of you, but Oklahoma has been having some amazing weather. This has been the first time I was able to wear short sleeves without crying cringing in a long time. I was so excited to wear this lace shirt (aren't the sleeves pretty?) and you know... show my ankles. This week the weather is supposed to stay in the 60s-70s, so you might get some more ankle shots. I know, scandalous. The weather has been amazing, I love it! I am so sad winter will come back at least for a little bit before spring is officially here. I'm someone who doesn't complain about the summer heat, I love it. :) I also love lace haha. That lace shirt is beautiful! I donned short sleeves today without a jacket and then turned around and went back and got a jacket. Lol. My goodness I love this! The lace shirt is so pretty, and the blue is so bold! It's supposed to snow a few more inches tonight (grr) but then get up into the 50's later this week! Oh my. that top is GORGEOUS! we were snowed in Wednesday evening, all day thursday, and out by friday. NC can't handle snow - I'm sure you saw it on the news. The weather is always decent here in CA. :-) I love that shade of blue. I think cobalt blue looks great with black. Nice look! That top is really pretty. And I thought we were getting spoiled with our 40-50 degree heat wave. Ha. Love those pants. I have blue pants on my wishlist for the year, but any time I see them in a store I go "man, do I really need a pair of blue pants?" I'll have to live through you for now! Gorgeous top!! Great styling with blue pants! Texas weather is AWESOME this week, and I'm wearing shorts today! In February! Those pants are amazing! Love it with the moto jacket! 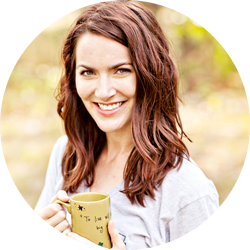 Thanks for the love on my blog! Ashley..this is an AWESOME outfit. For reals. You look so fierce! I love that top. Beautiful lace top! Love it! I love the color of those pants!! And I'm on a trip to TX right now--oh man, I am loving this warmer weather! Fantastic! What a great jacket!! 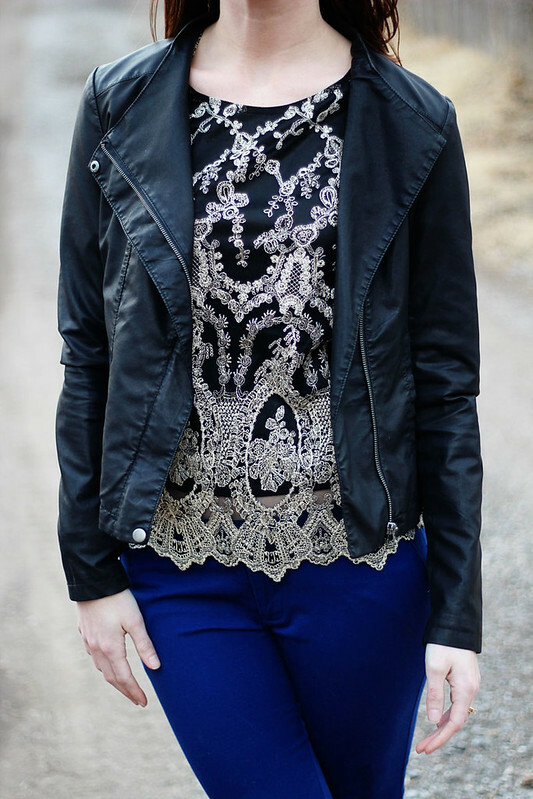 leather and lace is one of my favorite combos and the blue pants just set it off! You look great - so glad you had a wonderful weekend with your friends! The things I would do for wine and steak right now... nom nom. What a beautiful shirt...and what a great price for it! I have a jacket pretty much like this and I just discovered the leather is cracking :O Anyway, love your top and love even more the fact you paired a feminine look with an edgy leather jacket. Naturally, I'm jealous of the warm temps you're having....but it will get here. Eventually!! I LOVE that top. I have also recently become convinced that a leather moto jacket is the answer to every wardrobe problem. I really am glad that Oklahoma is getting such beautiful weather. Seeing instagram photos from my family there makes me long for spring. I am looking out the window to piled up snow. Sigh. Love that top! The lace and the leather combo is fabulous. And I love the bright jeans too. We are having some nice weather right now too… hope it lasts for both of us! That is the most gorgeous shirt I've ever seen... not even kidding. And the weather is awesome here too! I actually wore flip flops and a short sleeve shirt today! Honestly, I was sort of confused staring at my closet this morning. It was like.. wait what do I wear if I'm not wearing a scarf or boots? this shirt is absolutely gorgeous, and i'm loving the color of your pants! can't wait until we have weather like you described over here in NJ. Wow, apparently I need to move to Oklahoma! Loving that lace top, too. So adorable! I love the top! Such detailing! This top is so, so gorgeous! I love all of the details! We actually had a hint of nice weather today in Va. I'm hoping it will stick around!! Beautiful lace top. The silver and navy is so pretty together. Such and adorable outfit. Love the lace top. 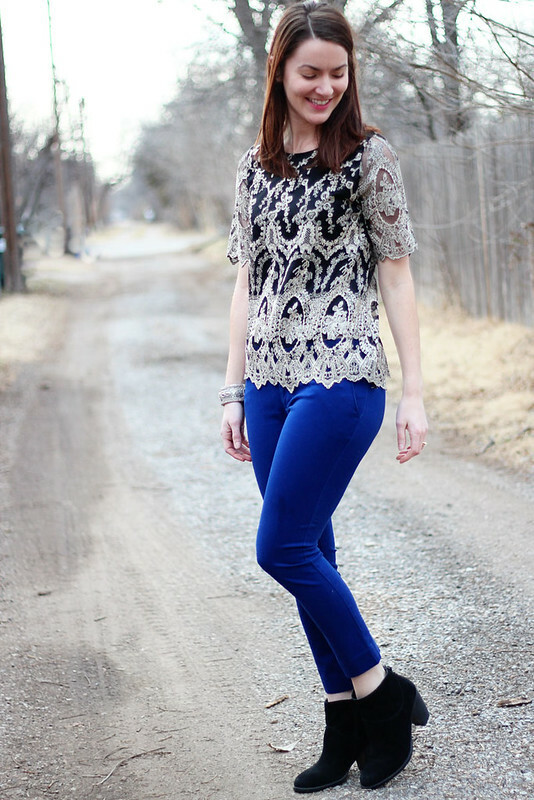 I don't know what I love more... the gorgeous lace top or the pop of bright blue pants! I just adore this whole outfit! The blouse is so detailed and feminine... I need that in my closet! love this outfit! especially the leather over the lace! what a great contrast!